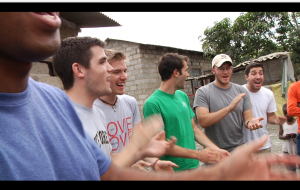 I had been on service trips before I went to Zambia this spring with Chi Rho, Wake Forest’s Christian male a cappella group. I’d seen poverty. I’d spent time with children in need and been encouraged by their uncanny cheerfulness. I’d even participated in religious ministry on these trips. The reason this time was different, however, was because I was seeing it all through the lens of my camera — trying to capture a story objectively (watch video) instead of engaging with the people and the situations around me. So when friends have asked me about the trip, I typically respond with a generic comment about it being a “great experience.” I think what that really means is that I haven’t yet had the time and distance for adequate reflection — something that 40 hours of footage is now helping inspire. 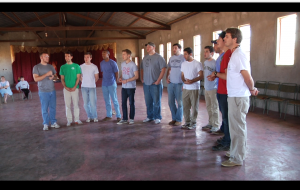 Chi Rho, a Christian male a cappella ensemble, performs in Zambia. It’s also difficult to explain to people why a group of a cappella singers felt compelled to travel halfway around the world just to spend six days there and head back for graduation — or why a documentary film graduate student found it worthwhile to go with them. I found myself wondering the same thing on the third day of the trip. 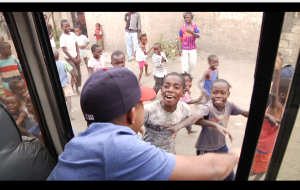 We had ventured deep into one of Lusaka’s many slums to deliver food to a family sponsored by our host organization. When the door shut behind us in the one-room cinder block hut, we barely had enough room to move. And though it was midday, the only light in the room came from the small LCD panel on top of my camera. Looking objectively at this “scene” — which is exactly what it was to my eye at the time – you might be tempted to give in to cynicism. Start adding up the cost of all the travel we’d done to arrive at this unlikely spot, not to mention the value of the equipment my wife and I were using, and then consider that the $80 of food we were delivering would last this family of four nearly a month. 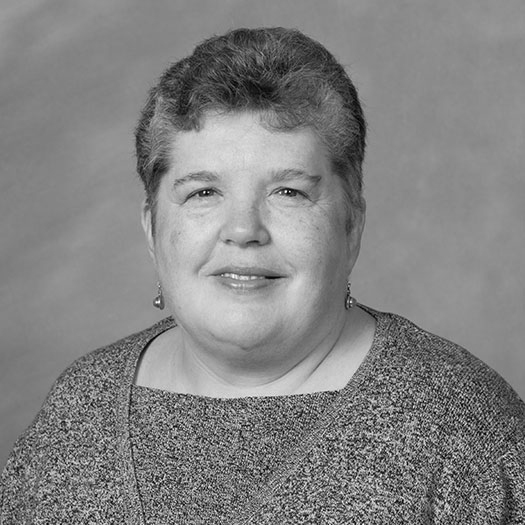 But I suppose one of music’s mysterious powers is to dispel both cynicism and despair, and I suspect if you had been there and really experienced the moment when Chi Rho started singing, such thoughts would have been far from your mind. There’s a sweet, sweet spirit in this place, and I know that it’s the spirit of the Lord … Humbling words to sing to a woman who has just told you she never thought she would have visitors who actually wanted to spend time with her in her home. To Zambians, says Sam Smartt, music is a way of life. I was in Chi Rho for four years, so I’m familiar with the routine. Sing around campus and every other Sunday at a church — maybe more if we’ve just finished a new CD. And then wrestle constantly with whether you’re doing all this for the ministry or the attention. Over time, however, I realized (as I think most of the guys do) that the moments I truly treasured were when the words we sang really meant something to somebody listening — when it became less about us. It’s funny because on the surface that wasn’t the case at all in Zambia. Not only was Chi Rho painfully conspicuous everywhere they went, but also many people there still speak their tribal tongues and few understood all the words to the songs. But what we discovered was that the music itself helped transcend the language barrier. I know that sounds cliché, but it’s true. To Zambians, music isn’t just about performance — it’s a way of life. So imagine our surprise when, after traveling thousands of miles to spread the gift of song to Zambian school children, we found that they had something they wanted to sing for us! This happened with almost all of the children we visited, and I can only describe the experience as incredibly refreshing. In Chi Rho, you go somewhere, set up, and sing. Here we were entering into a dialogue. Chi Rho performs for a group in Zambia.